Recently two videos emerged on Twitter of Denis Cuspert aka Dego Dogg aka Abu Maleeq aka Abu Talha al-Almani who is allegedly shown in Syria as part of a group called Junud al-Sham. Both videos are “trailers” with the promise of full versions to be released soon. The first video, published on August 14th, is entitled “Abu Talha al-Almani Dokumentation Teaser”. The short clip was published by ShamCenter on YouTube and also disseminated via Twitter. It has been viewed about 180,000 times by August 25. As of August 28 it has over 190,000 views. It was also published with the Turkish title “Deso Dogg Suriye’de muhaliflerin safında Esed’e karşı savaşıyor” (“Deso Dogg fighting on the side of the opposition against al-Assad in Syria”). This had an additional 50,000 views as of August 25th and is up to over 90,000 views as of August 28. Twitter member @almnther posted a picture of Denis Cuspert, showing him before his reversion to Islam and transition as a “Salafist” now turned “jihadist”. The picture on the right shows the former rapper with limited fame after his migration to Syria. The picture on the left is taken from his album “all eyes on me” (sound bite here). “Malik” was transliterated as “Maleeq”. When searching for “Abu Maleeq” on YouTube within the related SalafiMedia channels, the vast number of his appearances provides interesting insight into the progress of Cuspert’s reversion to Islam and his embrace of radicalism (see here, for example). 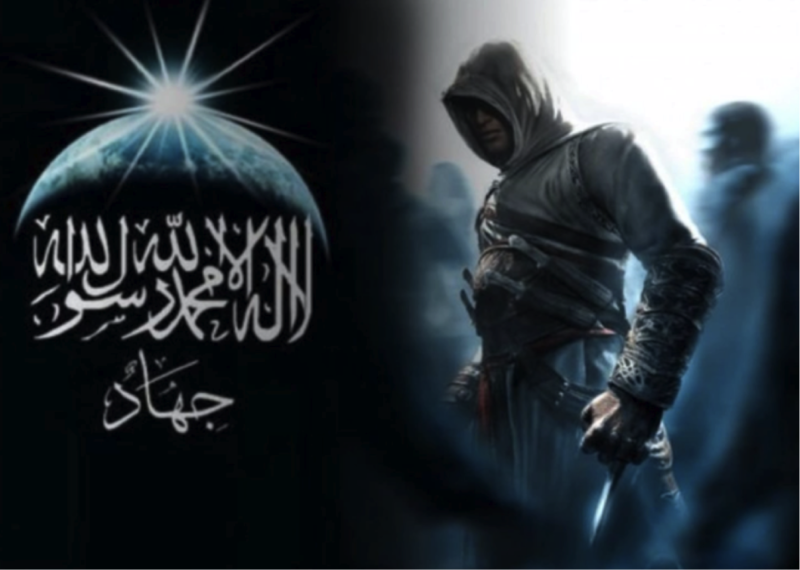 It should be noted that the jihad music videos are sometimes enriched by pop-cultural aspects, or electronic game elements, such as the latest Call of Duty main theme which had been popular in jihadist circles (see here, other examples: Assassins Creed, Counter Strike, Facebook/CoD). His most recent Jihadi hit, al-Jannah al-Jannah, was published as usual by the Global Islamic Media Front and received some coverage in the German media. According to the article, German authorities warn that Cuspert has previously been involved in burglary, blackmail, armed robbery, assault, and manslaughter. “And today he doesn’t seem to be taking the rigid Islamic lifestyle too serious: investigators grade him as a “consumer of narcotics”, according to an internal LKA document.” As mostly the case, the “al-Jannah al-Jannah” nashid was advertised for on the Arabic and non-Arabic jihadist forums. Sham Center maintains a multilingual website of most likely German dominance where videos and news in general are posted, both from jihadi as well as mainstream media sources. Naturally, Twitter (note the German car sticker in the picture), Facebook, Google+, Skype (shamcenterinfo), email and other contact information is available. The Twitter account has a mere 90 followers, with the majority consisting of mainly academics, journalists and CT analysts. The tweets replicate a typical jihadi style of content and rhetoric. The Twitter activity consists of mostly provocative messages directed to German authorities (here) and some basic information on the conquest of parts of the area of the Jabal Akrad and Jabal Durin, as promoted in one of their videos in German, Russian, and Arabic. The claim to be soon advancing on the city of Latakia is repeated (visiting the German Mujahideen, Chechen fighters). The Chechen commander Abu al-Walid Muslim is prominently advertised by ShamCenter and is seen in a video explaining the territorial gains made in Russian (Arabic dubbed version here). Al-Walid has previously been one of the key leaders of the “Liwa’ al-Mujahideen bi ard al-Sham” (Latikia) and received some social media fame for his eulogy of a fellow Chechen explosives expert. 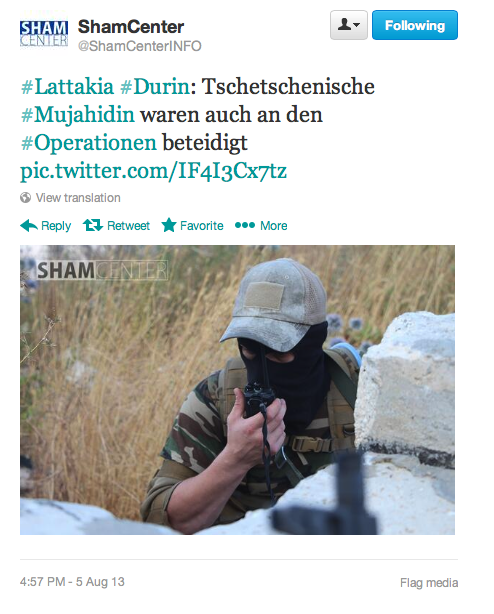 A German and Arabic language video of the attack and conquest of the Jabal Akrad and Durin was published by the Center and most tweets are related to the film (here, here, here). Let’s have a look at the first video, the “documentary about Abu Talha al-Almani”. The clip starts by visualizing his reversion to Islam, smiling into the camera with his “Thug Life” shirt and his movie styled crew before committing – what seems like – some kind of robbery. The title “A Documentary about Abu Talha al-Almani” flashes into the screen, summarized by the statement, “from the darkness, into the light.” This scene is concluded by Cuspert in his make-shift combat fatigue, sitting at a natural water spring splashing with water. The teaser starts with an Arabic nashid which is then carried on in German by Cuspert smiling and claiming to now reside in the “land of honor” (Boden der Ehre), calling to Jihad in Syria. This is a reference to two German jihad videos of the same title by the Chouka brothers from the Islamic Movement of Uzbekistan. The second video with far lesser views is of a more serious nature with Abu Talha being presented as both a real-deal mujahid and an ideologue who will give a lengthier sermon in the forthcoming film. Cuspert allegedly joined up with an unkown group called Junud al-Sham (“The Soldiers of al-Sham”, in short a reference to greater Syria). The video starts with a masked man hushing the audience to be silent, switching to perhaps the same water spring in the first video. It states “in cooperation with Junud ash-Sham, a talk by Abu Talha al-Almani: Holiday Greetings (Urlaubsgrüße)”. The following scene shows Cuspert in a military outfit, armed with a commando version of the AK47 marching in a forest area with an armed troop detail following in line. Most of the men are masked with last guy carrying a small AQ / ISI (or ISIS) flag. The “trailer” concludes with Cuspert sitting and apparently lecturing these Mujahideen who he has just, according to the video, led to this meeting point. Denis Cuspert, born 1975, (Deso Dogg) renounced his former rap-star career in an emotional video some time ago before he then started to rise as a new German-language nashid singer. He chose the name Abu Maleeq and is now known as Abu Talha al-Almani. At least in his hometown Berlin he was a known rapper and has become “somewhat as the first Jihad-Pop Star of Germany” (Schmidt, 2012). He seemed to have been ideologically guided by his companion and leader, the Austro-Egyptian Mohammed Mahmoud (Steinberg, 2012), who took advantage of Deso Dogg’s musical skills to convey specific ideological notions and sentiments by nashid. A nashid is an a cappella styled Jihad-rhyme that in the meantime is an essential genre on- and offline to convey the content of jihadist ideology (for example here). Such battle-songs became popular during the 1980s but have since gained broader popularity thanks to online dissemination. German nashid, freely available on YouTube, are easy to comprehend, rhythmical, and contain religious Arabic code words. The effect of the ideological content is strengthened and emphasized by pictures or short video sequences. The ambition of Deso Dogg certainly is and had been to be one of the most important German nashid singers. The perhaps most impressive German hymn is “mother remain steadfast” (Mutter bleibe standhaft), recorded by Mounir Chouka, originally from Bonn, who is one of the key German media activists for the Islamic Movement of Uzbekistan. He and his brother Yassin produce lots of videos and nashid from their base in the Pakistani Tribal areas (Prucha, 2012). Deso Doggs appearance in two trailers, claiming to have travelled to Syria and joined the Junud al-Sham is intended to portray him as a mujahid who acts on his words and who now finally has the chance to engage in combat. The question remains for now to what extent he will fight, or even if he will fight at all, and go beyond acting merely as a media-mujahid / singer and preacher for the cameras, splashing around in waterfalls. Yesterday, Ahmad ‘Ashush published a fatwa on the jihadist forums where he “decrees and calls on all Muslim youth in America and in Europa to fulfill this inescapable obligation. Namely, to kill the director, producer and the actors and anyone who helped to promote this film.” The fatwa was published by the relatively new al-Bayan media group that has established itself in the jihadist forums since the turmoil in Egypt. The media group acts in parallel to the al-Faruq media battalion, which has in the meantime published several videos showing Egyptian cleric Ahmad ‘Ashush with other renowned jihadist scholars in Tahrir, such as Muhammad al-Zawahiri or Marjan Salim (videos here and here). Ahmad ‘Ashush first surfaced in the al-Shumukh forum a while ago with a lengthy interview talking about the Hizb al-Nur (here) and established himself as an Islamic authority clearly adhering to the “jihadist torrent” while his – as of now – few writings are online over at al-Maqdisi’s Minbar al-Tawhid wa-l-Jihad website (here). The German-language propaganda departments had plenty of new materials and produced videos and published reaffirming translations justifying violence in support of the prophet. Again, GIMF published a German translation of al-Maqdisi’s writing “The Drawn Sword against those who Insult the Lord, the Religion or the Messenger of God” (Arabic and German). This is based on the historical writing of Ibn Taymiyya, available on al-Maqdisi’s site here. ‘Ashush seeks to act as a high-profile ideologue, citing in length the hadith and drawing on Ibn Taymiyya. “Killing them [the movie affiliates] is a duty for every capable Muslim. The killing of the aforementioned is prescribed by Islamic law (…).” Stating two examples, Ka’b ibn al-Ashraf, a Jew, that Ibn Taymiyya in detail analyzed and a woman who had insulted the prophet, ‘Ashush makes his case clear that “the prophet had commanded the killing of al-Ashraf” as well as the killing of a woman, as stated later. For ‘Ashush this serves as proof that anyone “offending the prophet, even Muslims, are sentenced to death for this.” Independent of Muslim or non-Muslim, man or woman, the blood of those insulting Muhammad must be shed. “For this is the ruling of the prophet”. ‘Ashush recounts the hadith of a female companion who on the account of a blind man insulted Muhammad and was subsequently put to death for her insults. The blind man had been her husband and he was the one who had killed her with his knife. He then stated to Muhammad the reason: “o messenger of God, I am her husband and she insulted you often (…) yesterday she insulted you and I took a knife and stabbed her in her stomach (…). The messenger replied: “so then witness her blood shed””. As the man had been blind and a companion of the prophet most aware of the shari’a, the woman insulting the prophet had been killed. She had been his wife, killed by him. Referring to the citation of the Qur’an, the prophet has a greater claim on the faithful than anyone else – even if this woman has children, or is the wife of a companion, she must be executed for her insult. Following a typical jihadist rhetoric, ‘Ashush repeats his statements of his writing in response to the insulting of the prophet in Germany, asking where the true scholars of Islam are, refuting the ‘state-owned’ ‘ulama’. In mid-April Elif Medya published a 30-page document in German justifying martyr operations. The text is essentially a significantly expanded translation of an English-language document published by Tibyan Publications a few years ago and attributed to the Saudi ideologue Yusuf al-Uyayri (d. 2003). The Tibyan text in turn was based on an Arabic text that al-Uyayri wrote for the Sawt al-Qawqaz website in late 2000 following the first suicide bombing in Chechnya (perpetrated by a woman named Khava Baraeva). Signed by “your brothers of the German Taliban Mujahideen”, the document has two parts. The first is a translation of the abovementioned Tibyan text. The second part presents writings on martyrdom by three other figures, namely Nasir al-Din al-Albani, Muhammad bin Uthaymin and Sulayman al-Ulwan. The latter is a notorious Saudi jihadi cleric while the first two are more mainstream (and deceased) figures of Salafi Islam. As a whole, the text provides a German-language assessment and justification for suicide missions. The treatise distinguishes between the concepts of “suicide”, “self-sacrificial” and “martyrdom” (istishahdiya) operations, highlights a definition by Yusuf al-‘Uyairi on who can be considered a “martyr” (shahid), and throws in a wide mix of historical sources to illustrate and support the argument. The main significance of the document is that it is in German and thus accessible to German speaking audience. It is the latest addition to a very rapidly growing body of German-language jihadi literature. Of all these new texts, the jihadist defense of ‘martyrdom’ operations by Elif Medya and the German Taliban Mujahideen may well be one of the most important. On 3 May a message announcing the death of Eric Breininger (b. 3 August 1987) and three of his fellow combatants was posted on several German jihadist websites. Breininger, who travelled to the border region between Pakistan and Afghanistan in the winter 2007, was one of the most infamous German jihadists. From Waziristan Breininger, a.k.a. “Abdul Ghaffar al-Almani”, sent several videotaped messages to the jihadist community in Germany, asking them to join the jihad or at least to support it financially. Since September 2008 the German Federal Criminal Police Office (BKA) searched for Breininger, based on his assumed affiliation with a foreign terrorist organization. A day after the announcement of his death, Breininger’s alleged autobiography, entitled Mein Weg nach Jannah (My Way to Paradise) was released on jihadi websites. The 108-page document mainly deals with Breiningers path into violent islamist militancy. It is not clear however, if Breininger wrote the document himself. In the messages he delivered from Waziristan, he spoke a very simple and often grammatically incorrect German. By contrast, the language of the published book is far more elaborate and correct. On the other hand, the content and details in the book argue for the authenticity of the document. Interestingly, the spelling of names differs throughout the book, which could indicate a collaborative effort. So we can assume that Breininger either 1) wrote it down by himself and had some help from his friends, or 2) told his story to some of his fellow jihadists and they wrote it down, as Spiegel journalist Yassin Musharbash suggested. Overall, however, we favour the first assumption. After stating the reasons for writing down his autobiography, that is to say to disprove the lies spread by the media and to guide Muslims and non-Muslims to the path of Allah, he describes his conversion. Breininger starts by telling us about his pre-Islamic life. Living together with his mother and sister since his parents’ divorce, he had the life of “a typical western teenager“, i.e. he went to parties and had relationships with girls. He calls this lifestyle “following condemned Satan’s way“ (p. 6). Breininger further describes his search for the meaning of life that initially did not lead to satisfying results. However, in his workplace he came into contact with a Muslim colleague who gave him the first lessons in the Salafi way of Islam and took him to a local mosque where he felt very comfortable. “I knew that I had to take measures against the crusaders who where humiliating our brothers and sisters. Also every Muslim should stand up for a life according to the law of Allah and for the reason that we must build an Islamic state” (p. 53). Breininger also states that they were appalled by the news from torture and prison abuse. Here we have another proof that it is these grievances caused by westerners themselves that help to radicalize. Breiningers first mentor in Germany invited him to his home and told him about the unity of God (tawhid) and the fundamentals of belief (´aqida). Breininger lays down the fundamentals of his belief by copying and pasting part of a book into his autobiography, dealing with the doctrine of tawhid. Later on, after meeting Daniel Schneider and Houssain al-Malla, Breininger learned about the doctrine of “loyalty (towards believers and god) and enmity (towards infidels especially)” (al-wala` wa-l-bara`). Loyalty and enmity, Breininger tells us, are “the most important fundamentals in islam and are the two main conditions for the true belief” (p. 56). He underlines his point by quoting the former leader of the Iraqi al-Qaeda (AQ) branch Abu Mus’ab az-Zarqawi (p.58). In the following part he writes about Jihad as an individual duty (fard al-´ayn), noting that “every Muslim who does not attend his duty to go out to follow Allahs path and to fight” is obviously a sinner (fasiq) and will be punished by God (p.59/60). As support he quotes the pamphlet The Defense of Muslim Land – The First Obligation after Iman by Abdullah Azzam. After al-Malla leaves the group for reasons unknown to Breininger (!) the latter’s situation begins to deteriorate because there were no other German-speakers amongst his comrades. Nevertheless, he completes his first training which is immediately followed by a second one. Here, the focus lies on the training with heavy weapons like recoilless guns, anti-aircraft weaponry and mines. Also the usage of GPS and radio equipment was part of the training. After moving to the so called “Istishhadi-house” (house of martyrdom-seekers) he describes some operations, one of them conducted together with mujahidin from the Taliban and AQ. It raised our eyebrows when we read that a chemical agent was used in a martyrdom operation against “murtaddin” in Khost. According to Breininger more than 100 “apostates and infidels” died (allegedly partly in the aftermath of the assault when the chemical agent began to take effect). Assuming that Breiningers account is true, this suggests ongoing cooperation between different organizations in Afghanistan. It also suggests, very worryingly, that Taliban and/or affiliated groups may be using crude chemical weapons. After three years as a member of the IJU Breininger still had problems communicating with his comrades. When he was approached by his commander and told that some German Muslims had recently completed their training and planned to join the Taliban, Breininger decided to do so as well. The Taliban had no objections to the founding of a subgroup, so the “German Taliban Mujahidin” (GTM) emerged. Thanks to Breininger´s account we finally know about the background of this group that virtually emerged out of nothing and kept analysts busy for a long time. Especially since the Taliban never officially approved the GTM as part of their movement. “If the brothers would buy one doner kebab less a week it would be possible to buy almost 20 sniper bullets to fight the kuffar” (p. 102). This appeal is followed by a call to Muslims to join the mujahidin because many of them want to start a family. The environment allows the breeding of children “free from the kufr of western society (…) This new generation of mujahidin grows up multilingual. They usually learn Arabic, Turkish, English, Pashtu, Urdu and their parent’s tongue” (p. 103). “With God’s permission this offspring will become a special generation of terrorists [sic] that is not listed in any of the enemy’s databases. They speak their enemy’s languages, know their manners and customs and are able to mask and infiltrate the land of the kuffar because of their appearance. There they will insha’allah be able to conduct one after another operation against Allah’s enemies thereby sowing fear and terror in their hearts” (p. 104). The memoirs of Erik Breininger, the German jihadist who was allegedly recently killed in Waziristan, have reportedly appeared online. I haven’t seen them myself yet, but if their authenticity can be established, we are dealing with an extremely valuable document. Jihadica will bring you more details soon. The al-Qaida media offensive against Germany earlier this fall turned out to be just a scare. But at a recent conference, German authorities said there was more to the threat than the September statements. Peter Neumann has interesting details over at FREEradicals. Der Spiegel has just published a full version of Fizazi’s letter, as well as a good article by Yasin Musharbash and Andreas Ulrich. Upon reading the letter it seems to me that Fizazi is speaking primarily about terrorism in Germany and by extension about terrorism in Europe. His statements do not amount to a renunciation of violence, but to a moderation of his previous views regarding where and against whom violence can be used. By saying that Germany is not a legitimate area of operation, he is implicitly rejecting al-Qaida’s global jihad doctrine. Unfortunately Fizazi does not elaborate on his views on violence elsewhere. I am speculating, but I suspect he still views attacks on Western targets in Afghanistan and Iraq as legitimate, not to mention the jihad in Palestine. It is not clear what he might think about attacks in the US or attacks on Arab regime targets. While all this makes Fizazi less of a moderate than many would have hoped, it makes his statement seem all the more genuine. Der Spiegel reports that the imprisoned Moroccan scholar Muhammad Fizazi has issued a letter to Muslims in Germany declaring Germany “not a battle zone”. The letter, which was allegedly issued on 21 July, has not yet been made public. Without knowing the precise content, it is difficult to assess its importance. We don’t know whether he is discouraging operations in Germany only, in Europe more broadly, or renouncing violence altogether. But Fizazi is one of the most influential ideologues in the European/North African jihadi sphere, so this could be quite significant. Of course, all the caveats of recantations from prison apply. Moreover, as I have said before, no individual recantation is going to end jihadism, but a critical mass of such declarations will have an influence. In any case, Berlin must be relieved. After the latest barrage of anti-German al-Qaida statements, here is finally a jihadi with nice things to say about Germany. Additionally, the name Mou10ra11bitt18oun25 appears to indicate the same with the 10 equating to October and the 11, 18, and 25 equating to the remaining Sundays in October. In Arabic, Mourabittoun is difficult to translate, but generally means people laying in wait. The Mou10ra11bitt18oun25 statement adds to the media hype regarding possible attacks on Germany. As Thomas has pointed out, these threats may be propaganda rather than preludes to an attack. If so, I am curious what the affect these threats will have beyond sending security organizations and on-line jihadis into a frenzy. 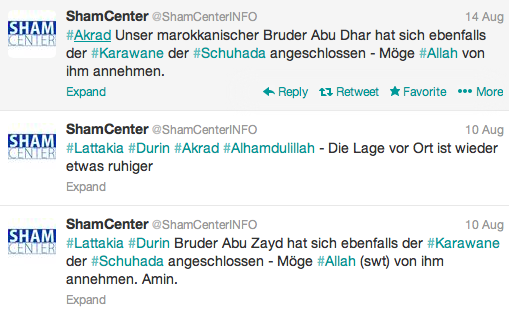 If there is not an attack in Germany, will al-Qaida’s credibility suffer among its supporters? Or, will the terror organization be able to pass it off as part of a larger strategy?